Quentin Franks Racing Review – Did it live up to its reputation? Quentin Franks Racing has performed extremely well for the first two months of the trial. Has it continued to bring the profits for a third month running? So first off I am going to look at how Quentin Franks Racing service has done to best odds guaranteed bookmakers and getting prices as close as I could to those that are advertised in the emails sent out. After 3 months of trialing the service there were 246 bets and a total profit of £1708 was made from stakes between £10 and £30. 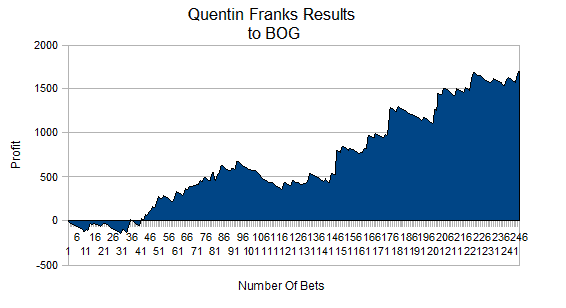 Quenting Franks has performed exceptionally to BOG bookmakers but not everyone has access to these accounts. Betfair SP is available to everyone that can access a Betfair account and during the trial we have measured Quentin Franks to SP prices also. After 246 bets the profit to Betfair SP prices was £790. The results of Quentin Franks Racing service have been excellent over the 3 month trial period. A 50% return on your investment is exceptional when betting with Best Odds Guaranteed bookmakers. The fact that the service also made a 23.37% roi to the Betfair SP prices shows that even those limited with the majority of bookmakers can still make a nice profit following this service. Quentin Franks Racing is an excellent service that offers great value. The only issue for some maybe getting the odds for BOG bookmakers as they tend to move very quickly. The best way to stay on top of this is to get a gmail account and allow notifications on your desktop or phone so you can react to emails as quick as possible. The service is consistent and emails are sent out every morning usually between 9-11 am. If there are no bets you might receive an email the day before to tell you so. I highly recommend this service it is very well run has a good track record with results going back to 2014 and during this trial the results have been exceptional. It gets a top rating for me. In this article I want to show you how you trade these selections and lock in a profit before the race starts or leave yourself with a bet at much greater odds and a lower liability. Quentin Franks Racing Service sends out selections at around 09.00. The odds move quite quickly after selections are sent so its important to prepare. If I am at home I have my laptop open with 3 or 4 bookmakers available in order to get my bets on as soon as selections are sent. There are times when I have just dropped the kids off at school and walking home. In this case I do the same on my phone opening 2 or 3 bookmakers tabs alongside gmail. You can see from the above image that I get my bets on at the advised odds with a little preparation. Once the bets are on I go over to Betfair and look for the same markets as the two selections that were sent out. I layed the first selection Elementary about 20 mins after the selections were sent at odds of 3.3. 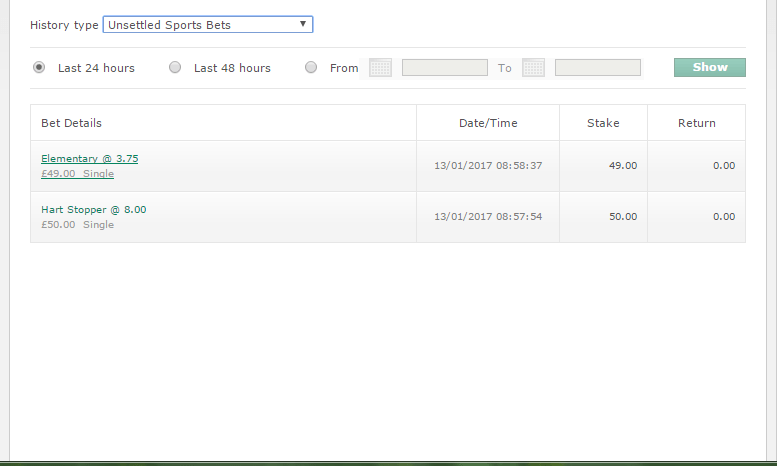 The screenshot above was taken later on in the day and as you can see if I had waited I would have been able to lay at much lower odds increasing my profit. My stakes were a back bet of £49.00 at 3.75 which returns £134.75 . A lay bet of £50 at 3.3 which gave me a liability of £115. This meant that I was basically risking the Betfair commission £2.50 (5% of £50) to win £19.75 which gives me effective odds of 8.9 on the horse Elementary winning. Lets look at the second selection Hart Stopper. I was able to back this at 8.0 with Bet365 risking £50 to win £350. Twenty minutes later I layed this selection at 5.8 where I risk £240 to win £50. If we break this down as a straight bet I was risking the Betfair commission £2.50 (5% of £50) to win £110 giving me odds of 45.00 on the horse Hart Stopper. Another advantage of this method is that sometimes a horse will drift back out in price. 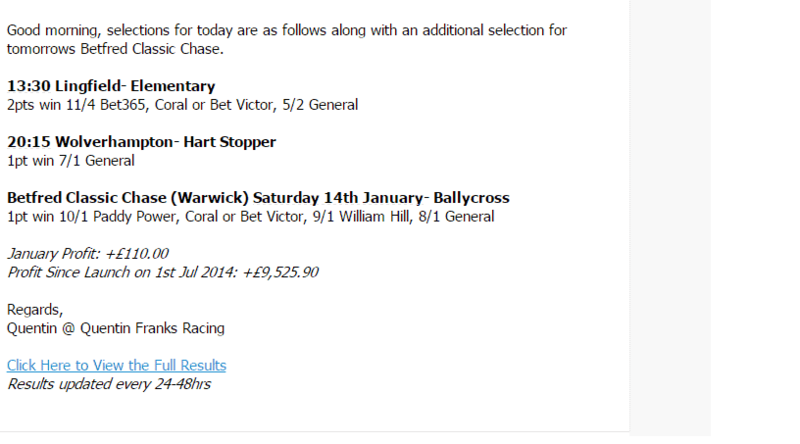 In the above example I backed Lady Bacchus at 4.5 with Bet365 and layed it at 3.85 on Betfair. The horse drifted and went off at an SP of 5.5 which resulted in a win of £85 with a risk of only £2. In this Quentin Franks Racing review we have shown a very low variance way of betting the selections which might suit people that prefer trading. There is also the ability of trading Quentin Franks Racing selections for a guaranteed profit before the race starts using the above strategy. Quentin Franks Racing offers a trial of 30 days for £1 using this strategy you will easily cover that and should make a very nice profit with a much lower risk then if you bet in the standard way. I like that included the Betfair SP price in the review. Most review sites just focus on BOG bookmakers which is always going to be the most profitable way to record results but not available for every punter.